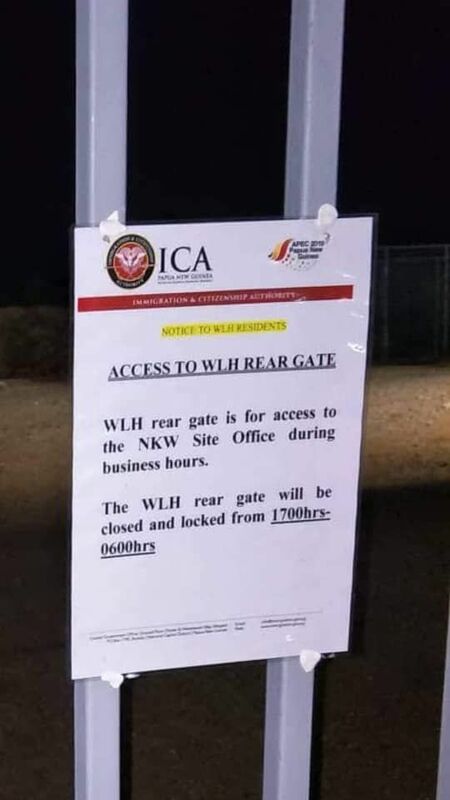 A notice abruptly posted that the back gate of West Haus detention compound (see photo) will be closed from 5.00pm to 6.00am Manus Island, has further restricted refugees’ movement on the island. A 6.00pm – 6.000am curfew already applies to all three refugee compounds on the island prison – East Lorengau Transit Accommodation, West Haus and Hillside. Until the notice posted on Saturday 29 September, refugees at West Haus could use the back gate to exercise and access the Hillside compound. The latest move is a further restriction that shows that the more than 600 asylum seekers and refugees are not free. The prisoners are also prevented from visiting each other’s compounds; they can only see each other during daylight hours outside of the compounds. They are also effectively confined to their compounds from 6.00pm – 6.00am. Nor can they leave Manus without approval from PNG immigration. Adding to the frustration of being a refugee but held prisoner for five years, is the fact that the US deal continues to be revealed as fraud. Hundreds of refugees who previously held hopes of being resettled in the US now know that there is no such hope. In the latest round of notices from the US resettlement team, only six refugees were accepted, while 13 were rejected. All four Iranians were rejected along with five Tamils, two Pakistanis, one Rohingyan and one Sudanese.